Saturday night, with a loud and raucous crowd of 9,166 on “It All Starts Here Night” at the XL Center, the Whale showed the kind of character that it takes to win in any league and in any sport as they came from behind in the third period again and beat the Worcester Sharks 3-1. Much like their NHL affiliates, the Eastern Conference leading New York Rangers, the Connecticut Whale now find themselves in that rarest of rare positions, believing they will win every game – and they’re playing like it. That comes from leadership and it starts with and trickles down from, Head Coach Ken Gernander, himself a, “Never-Say-Die” kind of a player in his days as the Hartford Wolf Pack captain. Gernander has injected this mix of NHL experienced veterans, rookies, young and emerging talents with the belief that staying the course, sticking to their system and playing as a unit will lead to W’s, and the players have fully bought into it. They sacrifice for one another and stick with their system no matter what the score is. That attitude is reflected in their incredible record in the third period. While most teams can hold a lead in hockey in third periods, the Whale had their struggles early, but are now a robust 15-2-2-2. However what’s more impressive is their amazing record when trailing after two which now stands at 6-9-1-2. This group is not intimidated by a third period deficit. That winning mentality is reinforced in the locker room by the veterans on this team. No more important veteran leader has emerged in the locker room than veteran defenseman Wade Redden. Saturday night he returned from the longest stay on the injured list of his professional career, 24 games. Redden was hurt crashing into the goalpost in a 2-1 loss to Providence on December 17th. With the former Ranger in the Whale lineup prior to the injury, they were 16-8-3-1. Without him, including a winless month of January, the Whale posted a 9-8-4-2 record. But Gernander’s team didn’t let a rough start in the first period, where the team was outshot 14-6 over all and only had three shots to Worcester’s eleven with 3:32 left, to take them off track. The two goals Gernander refers to came 57 seconds apart in the third period with the Whale trailing 1-0 on a fluky second period goal that was credited to Worcester enforcer Jimmy Bonneau off a double deflection that hit both Redden’s and Sam Klassen’s stick before floating over Talbot’s glove side shoulder. The first came at 8:52 off a faceoff win by Kelsey Tessier from former Wolf Pack center, Tim Kennedy back to Redden. “I was in the right place at the right time,” Thuresson said of his eleventh goal of the season. The Whale lit the lamp again off the rush when Kris Newbury cashed in with his team leading 19th goal of the season. The Whale would add a third goal with just 36.3 remaining. With Tyson Sexsmith (10-9-5, 35 saves) pulled from the net for an extra attacker, Casey Wellman picked up a loose puck in the neutral zone and dashed off on a breakaway. As the Whale’s latest acquisition came in close, he was tripped up from behind by Kennedy. Referee Jean Hebert correctly awarded the goal to Wellman, his 17th of the season and third since joining the Whale. But the system. 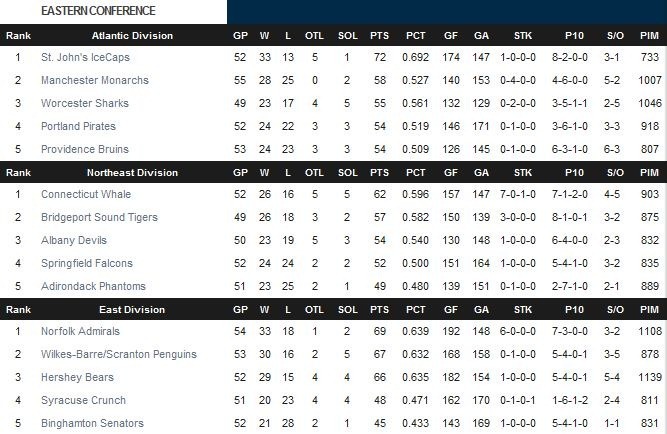 It was their dedication to their system that has elevated them back into first place, five points over the equally hot Bridgeport Sound Tigers who remained five points behind the Whale but hold three games in hand when Bridgeport came from behind to beat the Adirondack Phantoms 3-2 at the Webster Bank arena in Bridgeport. Just like they’ve been taught. The Whale will take their system and move on to Providence on Sunday to do battle with the Bruins. Bill Ballou takes you inside the Sharks locker room at Telegram.com. * In celebration of “It All Starts here” night the Whale gave a poster to the first 5,000 fans that included all people that started their career with the Wolf-Pack including Rangers captain Ryan Callahan, All-Stars Dan Girardi and Marc Staal, Brandon Dubinsky, Artem Anisimov, Ryan McDonagh, Michael Del Zotto and Michael Sauer. Five players in the picture have been with the Whale this season – Carl Hagelin, John Mitchell, Stu Bickel, Chad Johnson and All-Star Mats Zuccarello. Also included in the poster was equipment man Jason Levy and Alex Case, who is the Manager of Madison Square Garden’s training center operations. The Whale hit the road to visit Providence Sunday for a 4:05 match with the Bruins. Bob Crawford is on with the pre-game on at 3:55pm. You can hear it on WCCC.com. Too far away or can’t make it? Listen live at WCCC.com or from your cell phone or computer you can get all the live action via our Twitter page: @HowlingsToday for all games both home and away. 1st Period- No Scoring.Penalties-Del Monte Wor (slashing), 10:03; Pelech Wor (fighting), 14:42; Nightingale Ct (fighting), 14:42. 2nd Period-1, Worcester, Bonneau 2 (Irwin, Viedensky), 6:59. Penalties-Sexsmith Wor (roughing), 2:08; Newbury Ct (hooking, unsportsmanlike conduct), 10:45; Moon Wor (hooking), 16:35. Shots on Goal-Worcester 14-12-9-35. Connecticut 6-19-13-38. Power Play Opportunities-Worcester 0 / 2; Connecticut 0 / 3. Goalies-Worcester, Sexsmith 10-9-5 (37 shots-35 saves). Connecticut, Talbot 11-11-0 (35 shots-34 saves). Linesmen-Brent Colby (7), Jim Briggs (83). 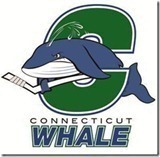 This entry was posted in AHL, Connecticut Whale, CTWhale, Hartford Wolf Pack, Hockey, New York Rangers, NHL, Sports and tagged AHL, Andre Deveaux, Andreas Thuresson, Bridgeport Sound Tigers, Cam Talbot, Casey Wellman, Connecticut Whale, CTWhale, Jeff Woywitka, Kelsey Tessier, Ken Gernander, Kris Newbury, New York Ranger, Wade Redden, Whale, Wojtek Wolski, Worcester Sharks, XL Center. Bookmark the permalink.